The 37th Annual New Bedford Half Marathon on March 16th marks the second race in the USATF-NE Road Racing Grand Prix series. But for Whirlaway‘s Sarah Prescott, the race signifies much more. In fact, once she crosses the finish line, she will have completed her 100th consecutive USATF-NE Grand Prix race. 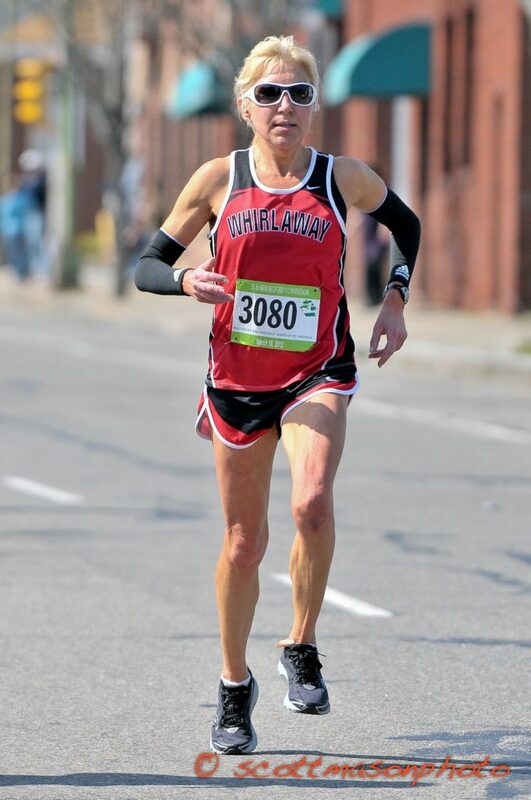 A runner since 1978, Sarah started entering Grand Prix races in 2000 when the club team she was a member of participated in the team competition. Motivated by seeing her name in the standings, she never looked back. Throughout this time, not only has she been a consistent name in our race standings, but she’s even found her way to the top of the results page many times too. She placed sixth last year in the series for the women’s 45-49 year old age group, and finished fourth the year prior. Showcasing her range, in 2013, Sarah ran 36:11 for the 5 miler, 1:36:14 for the half marathon and 3:53:49 for the marathon. Considering the variety of distances included in the Grand Prix, Sarah’s training must prepare her for all sorts of races. This is why she has tailored her training based on the Grand Prix race schedule each year. We would like to extend our congratulations to Sarah for her dedication to and successes in the USATF-NE Grand Prix series, and wish her continued success, especially at the upcoming New Bedford Half Marathon! This entry was posted by Jenny Gardynski on March 4, 2014 at 5:37 pm, and is filed under Long Distance Running. Follow any responses to this post through RSS 2.0.Both comments and pings are currently closed.